Program Note: Tune in tonight to hear Randi Kaye talk to Samantha Hillstrom on AC360° at 10 p.m. ET. 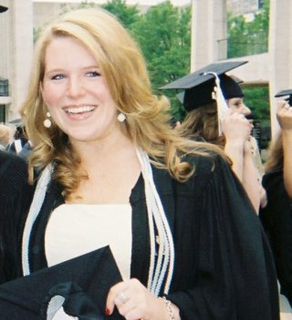 CNN Production Assistant, Samantha Hillstrom, at her graduation in May 2007. I’m about to talk about two little words that make most people cringe. The mere mention of these words usually incites the same reaction in everyone: a) fear b) denial c) a throbbing headache and d) the desire to run away screaming and crying and begging to go to a “happy place.” Yes, I am talking about STUDENT LOANS. If you don’t have one, you know someone who does and you sympathize with them. In the midst of the credit crisis, home foreclosures and bailout turmoil, the amount of debt that graduates are facing is overwhelming. I am 23-years-old, two years out of college and I am sitting on $115,000 of student debt. And based on my lender's loan terms, I only have roughly 12 years to pay it off. How much does that make my monthly payment, you ask? A whopping $1,200 a month. And let’s just say my lifelong dream career in television doesn’t lend itself to that. The only option my bank is giving me is to go on “graduated repayment plan.” That means that for four years I will only be paying off the interest every month. How much is that? Well, $115,000 with interest rates between 4-8%... that’s about $600 a month and that doesn’t even touch the principal amount. People don’t pay off houses in 12 years and I am expected to pay off this student loan in an entry level position? Some might say, “Sam, you shouldn’t have gone to a private school in New York City if you wouldn’t be able to pay it off.” Well, I made a lot of mistakes when signing up for my loans, but I was uneducated on the process and on the repayment and now I’m stuck. I share the same anxiety as the families struggling to pay their mortgages. How was I ever to expect the financial crisis that was going to happen and where can I get some help? And why do I have such a short amount of time to pay off my loans? Because of the current financial crisis. Due to the economic downturn, my lender isn’t consolidating loans. If I were able to consolidate, my repayment time would extend to 30 years…just like a home mortgage. Now that wouldn't necessarily solve the problem, in that I would still owe more than $500 a month with the principal and interest, but it would buy me a bit more time and stretches out the money. Here is my question: why aren’t student loans receiving the same attention, same care and forgiveness as every other loan in America? I have to say that I am lucky to have a job right now and was especially lucky to get a job right out of college. Can you imagine what kind of pressure and stress the 2009 graduates are feeling in this time of uncertainty? Veterans of the workforce can’t find work right now. What about the recent college grads with no work experience and tens of thousands of dollars of unforgivable debt underneath them? There is a grain of hope that will come when the Income-Based Repayment Plan, part of the College Cost Reduction and Access Act of 2007, will take effect on July 1. The program will cap off borrower’s monthly payments at 10% of their gross income for 25 years with the rest of the debt being forgiven. However, that only applies to federal loans (which is only one of my four loans). According to the Federal Education Department, in 2009, the amount of outstanding federal student loans is $544 billion, up $42 billion from last year. Where is our bailout? Where are our options? The default rate on student loans this year is already at 6.9%. That’s a 13% increase from last year. Recently, Rev. Jesse Jackson started a campaign called “Reduce the Rate” urging the Obama administration to reduce the interest rates of student loans to 1%....the same amount of interest the banks are getting. Reduce the interest rate on all student loans to 1%. If banks can borrow at 1% or less, then so should our students. Extend the grace period before loan repayment begins from 6 months to 18 months for students who graduate. In these tough economic times, it takes a college graduate an average of 6 months to 1 year to find a job. The rules should reflect this reality. End the penalties assessed to schools for student loan defaults. Schools should not be held accountable for students who don’t pay back their loans. I chose to go to a private school and I chose to work in a field where the starting salaries are low. Does that mean that I chose to live a life of struggle, wondering how I am going to pay my rent, afford the basics of living and still stay in my chosen career field…all while putting up with high interest rates and an amount of debt that brings me to tears?